We’d love your help. Let us know what’s wrong with this preview of The Orchardist's Daughter by Karen Viggers. Sixteen-year-old Mikaela has grown up isolated and home-schooled on an apple orchard in southeastern Tasmania, until an unexpected event shatters her family. Eighteen A story of freedom, forgiveness and finding the strength to break free. International bestselling writer Karen Viggers returns to remote Tasmania, the setting of her most popular novel The Lightkeeper's Wife. To ask other readers questions about The Orchardist's Daughter, please sign up. What is the title listing for this on Amazon? I found The Orchardist's Daughter to be an absorbing read, and an interesting look into some critical conservation issues that Tasmania is fighting. We follow the lives of those living in a small logging town in southern Tasmania, including Leon, a park ranger, surrounded by those whose livelihoods his job threatens, and Miki, who runs the local takeaway with her brother Kurt. Leon finds himself as an outsider in a town full of bullies, and struggles to integrate, but his challenges are nothing I found The Orchardist's Daughter to be an absorbing read, and an interesting look into some critical conservation issues that Tasmania is fighting. We follow the lives of those living in a small logging town in southern Tasmania, including Leon, a park ranger, surrounded by those whose livelihoods his job threatens, and Miki, who runs the local takeaway with her brother Kurt. Leon finds himself as an outsider in a town full of bullies, and struggles to integrate, but his challenges are nothing compared to Miki's, whose overprotective brother has strict rules about her behaviour, and she finds herself trapped inside her own house with no friends. As Leon and Miki set about finding the courage to change their circumstances, we learn about the plight of the poor Tasmanian Devils, with their facial tumours killing them off at unprecedented rates, and the logging of the forests, with the potential to leave nothing for future generations. Karen Viggers obviously has a great love for the area, it's flora and fauna, and this really comes to the fore in this story. She writes with great sympathy about a growing problem. However it was with the characters themselves I struggled with, most of which are cliched, some totally over the top. In fact the only characters I felt any affinity with were Leon and his Grandpa, and this let the story down a bit for me. but all in all I found the Orchardist's Daughter to be a good read, with a strong message to tell. When Leon Sixteen-year-old Mikaela moved to the small timber town with her older brother Kurt after their parents were lost in a house fire. Miki grieved for her parents, but Kurt made a home for them behind the fish’n’chip shop which they ran. Being the only takeaway shop in town they were reasonably busy – but Miki didn’t get out except with Kurt when they went to the forest on a Monday. He kept her closeted inside – for her safety he said. Miki didn’t argue; she didn’t want to make him angry. The Orchardist’s Daughter by Aussie author Karen Viggers is a beautifully written story of dominance, a need for freedom other than in the pages of a book, determination and a deep love of nature. Set among the eucalypts of southern Tasmania, Miki’s affinity to the forest, the Tasmanian devils, the majestic soaring eagles who nested in the forest – plus Leon’s love of those same forests which were in his blood – then the tense, gritty and breathtaking finish – all made for an excellent novel which I highly recommend. This started really well! I liked Leon as a character and loved the Tasmanian setting. I could see a good mystery developing regarding Miki and Kurt. All good so far. As the story proceeded and we met more characters the abuse appeared, which is okay as a part of the whole story, but in The Orchardist's Daughter it took over the whole narrative. Domestic abuse, child abuse, bullying - even some unpleasant passages about cruelty to dogs. I found myself skimming which means I am not actually enjoyi This started really well! I liked Leon as a character and loved the Tasmanian setting. I could see a good mystery developing regarding Miki and Kurt. All good so far. As the story proceeded and we met more characters the abuse appeared, which is okay as a part of the whole story, but in The Orchardist's Daughter it took over the whole narrative. Domestic abuse, child abuse, bullying - even some unpleasant passages about cruelty to dogs. I found myself skimming which means I am not actually enjoying the book, just hurrying to get to the end. What a magnificent book written by Aussie author Karen Viggers. This was one of those books where once you started it you didn’t want to put it down, but as I was coming closer to the end, I did put it down for a bit as I didn’t want the story to end as it was such a good story. Mikaela lived a lonely and isolated life with her parents and brother on the family farm. She was home schooled, so there was no interaction with other children. Her father had strong views on certain issues such as men What a magnificent book written by Aussie author Karen Viggers. This was one of those books where once you started it you didn’t want to put it down, but as I was coming closer to the end, I did put it down for a bit as I didn’t want the story to end as it was such a good story. Mikaela lived a lonely and isolated life with her parents and brother on the family farm. She was home schooled, so there was no interaction with other children. Her father had strong views on certain issues such as men worked hard on the land and a woman’s place was in the home tending to chores around the home. The day a fire ripped through the house was the sad day Mikaela and her brother Kurt lost their parents. From that day on Kurt took charge and looked after his sister and together they started over once more. They worked side by side in a fish and chip shop and living behind the shop meant they never had to travel far for work. Once again Mikaela felt isolated, in fact she felt like a prisoner as Kurt wouldn’t allow her to go out at all only to go to work or when it suited him other than that he locked the door whenever he went out. As time passed Mikaela was desperate to get outdoors and enjoy some sunshine, but it was not to be until she found a way which she had to keep secret from Kurt. Mikaela knew her brother was up to something, but she couldn’t work out what it was. Eventually Mikaela would discover the horrible truth of why her brother had kept her locked up and the secrets he had been hiding. This story is set in Tasmania a place I visited not so long ago and I must say the descriptions throughout this book are spot on. A truly beautiful setting for a beautifully written story a story which covers a diversity of important issues. This truly was a captivating and intriguing read and one in which I thoroughly loved. Highly recommended. The Orchardist’s Daughter is the fourth novel by Australian veterinarian and author, Karen Viggers. Parks Ranger Leon Walker has finally left his parents on Bruny Island to take up a position in a small southern Tasmanian logging town. He can still head back to mum if she needs him, but he’s hoping he can make a difference to the public’s attitude to conservation. And here he can visit Grandpa, maybe get him talking about family history a bit. In the eighteen months since Mikaela Muller’s parent The Orchardist’s Daughter is the fourth novel by Australian veterinarian and author, Karen Viggers. Parks Ranger Leon Walker has finally left his parents on Bruny Island to take up a position in a small southern Tasmanian logging town. He can still head back to mum if she needs him, but he’s hoping he can make a difference to the public’s attitude to conservation. And here he can visit Grandpa, maybe get him talking about family history a bit. In the eighteen months since Mikaela Muller’s parents died in the fire that took their farmhouse, she and her older brother Kurt have worked hard in their Takeaway shop. Miki really misses their orchard and being close to the forest, but they’re saving to be able to afford another farm. Meanwhile, she and Kurt have Mondays in the forest: they tend their hives, and Miki can spend time watching the wedge-tailed eagles and marvelling at the ancient Swamp Gum. Kurt and Miki are worried about the advance of the loggers and their destructive machines, and Miki wishes she could spend more time in her forest, something that makes her feel so good, but when Kurt goes to Hobart, he locks her in. He doesn’t like her talking to customers, but she sees what’s going on in the town, and has friends, even if she’s unaware of them. Ten-year-old Max, Leon’s neighbour, is one of her favourites, bright and enthusiastic, but lately he’s been behaving out of character. What a wonderful story Viggers gives the reader. Three separate narrative strands give events from the perspectives of Miki, Leon and Max. And while some aspects may be predictable, several underlying mysteries will keep the reader guessing, and there are a few turns before a thrilling climax and a realistic ending. Viggers touches on age-old issues including domestic violence and bullying, but also presents several aspects of the debate over logging versus conservation, and the problem of Facial Tumour Disease in Tasmanian Devils. The depth of her research into these subjects is apparent on every page, as is her love for Tasmania’s forests and her unique wildlife. Viggers also has a gift for descriptive prose: “a bushy beard like a nest of lichen draped from his chin” is just one example. Her characters are certainly not stereotypes: they all display very human faults and weaknesses along with their generosity and good intentions. No doubt of particular appeal to many readers will be Grandpa, Max, Geraldine and Lily Moon. Readers unfamiliar with the work of this talented author will certainly be checking out her backlist after reading this brilliant novel. The Orchardist’s Daughter is a book that I have been eagerly awaiting. This new novel from Australian storyteller Karen Viggers is a beautiful tribute to Tasmania, its unique wildlife, old growth forests and pristine environment. Underneath, The Orchardist’s Daughter is a story of disconnection, belonging, friendship and survival. I was absolutely taken by this book, from the opening to the closing moments. There are some stunning novels that have been inspired by and set in Tasmania. Since a trip I made to Tasmania in 2010, I have developed a sense of connection to this beautiful part of Australia. I can’t get enough of stories set in Tasmania! The Orchardist’s Daughter well and truly met my reading needs. There are three main characters that form the lifeblood of The Orchardist’s Daughter. There is Miki, a teenager on the cusp of adulthood trying to find her place in the world. Miki is silenced and constrained by the tight rein her overly protective brother has placed her. Miki’s life is defined by the simple of joy of exploring the outside world when circumstances allow and her love for the written word, in particular classic books (a sub narrative strand I relished). Then there is Leon, a newcomer who is hoping to make a fresh start in his new role as a conservation officer. Finally, the book is also told through the eyes of Max, a ten year old boy, who comes from a dysfunctional family, defined by violence. As the story progresses, Max also becomes the subject of a local bully. These are diverse characters, but Viggers demonstrates the skill to get inside each of their heads with ease. Although the initial connection between these three contrasting characters seemed quite uncertain, and I wasn’t sure where Viggers was going to go with her protagonists, the developments made in terms of the narrative quickly dissolved any reservations I had. Aside from the strong characterisation prevalent in The Orchardist’s Daughter, there are a range of themes that are handled with care and professional insight by Karen Viggers. From isolation, belonging, connection, comfort and courage, this plays out against a heartbreaking and a scathing insight into violence, coercion, submission and bullying. These are emotional and hard hitting themes, but Karen Viggers treads delicate ground, offering an honest and eye opening portrayal of issues that we tend to ignore. In fact, the role of the bystander struck me quite hard in this piece. So many people of the local town sat by and knew about Miki’s predicament, but did nothing. The role of character’s such as Leon and Geraldine were important, acting as a catalyst to bring about a process of change and support to Miki. Likewise, Leon acts as a big brother or buddy figure for Max, just as he is dealing with one of the hardest experiences a juvenile can face, bullying. All of these themes receive expert treatment by Karen Viggers, it is never presented in a sentimental, or preaching way. Another aspect that I absolutely adored and connected to on another level was the conservation focus of The Orchardist’s Daughter. Viggers draws our attention to the conundrum between logging, forestry techniques and preservation. She takes an introspective and well rounded look into small town community perceptions. Viggers raises the possibility of tourism versus logging as a source of income for these old timber communities. However, the thread that I enjoyed most was the emphasis on the plight of the Tasmanian Devil. Viggers’ focus on the facial tumour issues plaguing these native creatures and Miki’s implicit connection to saving these creatures struck a chord. If you are a nature lover, expect to be dazzled by the bounty of descriptions around other native fauna, and the vivid depiction of the local scenery surrounding the backdrop of The Orchardist’s Daughter. There is also an undercurrent of mystery and intrigue that flows through The Orchardist’s Daughter. We know that Kurt, Miki’s brother, is a bad seed and up to no good. This reaches crisis point in the final chapters of the novel. My pulse was beating so hard in these suspense scenes, which was executed just perfectly by Karen Viggers. Tasmania truly comes alive through the stunning mode of storytelling executed by Karen Viggers. The book also raises some important questions around community perceptions, bullying, family violence, loneliness and understanding. The Orchardist’s Daughter is a novel I would recommend without reservation, it is a remarkable yarn left that a strong mark on my heart. Evocative descriptions of Bruny Island and the Tasmanian landscape, made this an interesting read. I especially loved the description of the Skywalk excursion. With the exception of Leon, his grandfather, Miki, Max and Geraldine, there are a lot of largely unlikeable characters and portrayal of a harsh lifestyle. As often happens, children learn from the examples they have around them, either in their own family of other townsfolk. Jaden is one who has learned from others Three and a half stars. Evocative descriptions of Bruny Island and the Tasmanian landscape, made this an interesting read. I especially loved the description of the Skywalk excursion. With the exception of Leon, his grandfather, Miki, Max and Geraldine, there are a lot of largely unlikeable characters and portrayal of a harsh lifestyle. As often happens, children learn from the examples they have around them, either in their own family of other townsfolk. Jaden is one who has learned from others in town how to be a sadistic bully. Kurt is another who is cruel and thinks only of himself and Mooney one who takes out his frustrations on his poor wife. Domestic violence, bullying and cruelty to animals are some of the issues covered. The majority of the men drink too much and swear like troopers, so the language gets a bit much and not just the f word. Despite those negatives there is a good story hiding in there of a man trying to fit into a new place and environment, a young woman trying to break free from the constraints of the life imposed upon her, and a confrontation between views of greenies and those living a hard existence while relying on the logging industry. The information about the Tasmanian Devils and their preservation when faced with the problem of Facial Tumour Disease shows the author has put plenty of research in and her descriptions show she knows her location well. Leon's arrival in the small, southern Tasmanian logging town signifies a new beginning; new home, new job, new life. He's looking forward to seeing more of his Grandpa, who is living in a nearby old people's home, but he knows it won't be easy gaining acceptance here, as the new Parks Officer in a town economically reliant on the forest. Next door, 10yo Max watches his new neighbour moving in with guarded interest. A sensitive kid, he gets lots of tough love from his mum, but it's the approval o Leon's arrival in the small, southern Tasmanian logging town signifies a new beginning; new home, new job, new life. He's looking forward to seeing more of his Grandpa, who is living in a nearby old people's home, but he knows it won't be easy gaining acceptance here, as the new Parks Officer in a town economically reliant on the forest. Next door, 10yo Max watches his new neighbour moving in with guarded interest. A sensitive kid, he gets lots of tough love from his mum, but it's the approval of his dad that he really yearns for, and rarely gets. When Leon suggests they get together to work on his footy skills, Max thinks this might be a way to become the son he thinks his dad wants. Meanwhile at the local takeaway shop, Miki works quietly and efficiently under the watchful, disapproving eye of her older brother Kurt. She's lived in the area her whole life, but is a relative newcomer to the town. Her sheltered life may have left her short of experience until this point, but she is smart and kind, and although she may not know it, she has many people in the town taking notice and looking out for her. Her favourite day of the week is Monday, when the shop is closed and Kurt takes her into the forest where she can spend time with her favourite tree; an enormous swamp gum, 90m tall. But Tuesday always follows Monday, and that's her loneliest day - the day Kurt locks her in at home while he goes to Hobart for his mysterious 'business'. At times heartbreaking, but at others uplifting, I loved this story of freedom. I so badly wanted everything to turn out well for Leon, Max and Miki, and although the ending wasn't happy for everyone, it was at least hopeful. This was the first time I've read anything by Karen Viggers, so I'm looking forward to seeing what else she's done. With thanks to Allen & Unwin for an uncorrected proof to read and review. The Orchardist’s Daughter is such a beautifully written novel. Through different characters lives I enjoyed the delivery of the premise that we all have different iterations of entrapment - some more tragic than others - that keep us from our desires; from our life objectives. This was the theme which flowed throughout the novel. Loveable characters like Max and Miki drew us into their world. Both of innocence trying to make sense of the harsh reality of growing up in a harsh environment. 'Villains' and 'heroes' were also portrayed realistically throughout the novel. Although there were predictable moments - which were enjoyable - there were a couple of surprises in the end to ensure a favourable outcome. It was wonderful to be transported to the Tasmanian highlands to learn about the logging industry - both past and present, the plight of the Tasmanian Devil, the friction delt to National Parks staff who inevitably live alongside their counterparts. The magic of the old growth forests was detailed in such a way that I am sure I could smell the mountain fresh air as I turned the pages! 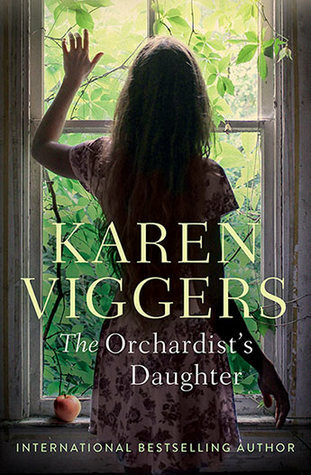 Overall I really enjoyed The Orchardist’s Daughter, I enjoyed Karen Viggers’ writing style and I can see this novel also becoming a bestseller. I received an advanced reader copy for an honest review. This is one novel that has been worth the wait and anticipation. The Orchardist’s Daughter is a study on bullying and its insidious transition into domestic violence. Set against the backdrop of a town divided, logger versus conservationist, the old growth forests of Tasmania and the disease afflicted Tasmanian devils give evidence to the effects that humans have had on this once pristine environment. The main characters that drive this story are Leon, Miki, and Max. Leon is new to town, a park This is one novel that has been worth the wait and anticipation. The Orchardist’s Daughter is a study on bullying and its insidious transition into domestic violence. Set against the backdrop of a town divided, logger versus conservationist, the old growth forests of Tasmania and the disease afflicted Tasmanian devils give evidence to the effects that humans have had on this once pristine environment. The main characters that drive this story are Leon, Miki, and Max. Leon is new to town, a park ranger who comes from a long family line of loggers. He’s instantly regarded with suspicion, nicknamed “Parkie” and subjected to bullying from some of the local loggers. Max is his neighbour, a 10 year old boy who feels as though he can never measure up to his father’s expectations, relentlessly bullied by an older boy who just happens to be the police sergeant’s son. Miki, 18 years old, is kept prisoner by her brother Kurt, forced to work in their takeaway business for nothing, locked in the house, not allowed to even step foot out of the front door of their shop, much less talk to customers. The constraint begins to wear thin, and she starts to sneak out when Kurt is not home, getting a taste of life and a growing yearning to be free. The lives of these three people intersect and the growing tension within the town begins to mirror events within their own lives. The characterisation within this novel is excellent. Three very different people drive the narrative, but there are all of these extra characters that come to life on the page as well. To me, it was as though the author has framed Leon as a sort of agent of agitation upon the town. He’s an outsider who moves in and observes what’s going on, noticing all of these really bad things that people are turning a blind eye to. This is a novel that gets your mind churning, stirring up all of these ideas that can be funnelled down into a single question: At what point does abuse become everyone’s business? In the case of Miki, everyone was quietly talking to each other about Kurt treating her badly and locking her in, yet very few people actually reached out to Miki to offer support. In the case of Liz, who was very obviously being beaten by her husband, no one stood up for Liz, not even the police. Jaden, the boy who was bullying Max, was observed regularly harassing and physically assaulting other kids, yet he was never called out for it. Leon knew his father was hitting his mother, so instead of calling his father out for it, he made sure he was home as much as possible because his father only ever hit his mother when they were at home alone. It’s an uncomfortable reflection, to consider just how much bad behaviour people let slide when something is ‘not their business’. For Miki, whose life was extremely limited, books provided a window to the world, but her brother would not allow her to use a library or buy more books, so she only had a few. Geraldine, an intuitive woman who works for the visitor centre, recognises that Miki is in a dire situation and begins to lend her books, strategically selected to help inform and empower Miki, in the hopes that she may become courageous enough to leave her brother. There was this wonderful connection between Miki and each book she read, and she did learn something from each one, about herself and her own life within the context of what she was missing out on. Kurt, Miki’s brother, was a real piece of work. Brought up in a misogynistic household, he treated Miki appallingly, but he was also hideously rude to his customers. There’s this section in the novel where he suffers an illness and I will openly say here that I was crossing my fingers hoping that he would die. He was that awful. Unfortunately, Miki left it too late to really see him for all that he was. Her memories of him from their childhood as the brother who had taught her so many things clouded her judgement and prevented her from taking a stand against his bullying. The Orchardist’s Daughter is beautifully written, an intersection of nature and humanity, a study of both the good and the bad within people. It’s honest and brutal, gentle and poetic, a real joy to read and linger over. South-east Tasmania provides the setting for this novel. Here, in a small timber town divided between those who want logging to continue and those who want to preserve the remaining forest, we meet three main characters who need to find their own place in the world. Mikaela (Miki) was 16 years old when her parents were killed in a fire. She’d been home-schooled by her mother on the family orchard. Miki’s isolation continued when she and her older brother Kurt moved into town where, eighteen months later, they are running a small takeaway business. Miki is kept a virtual prisoner by Kurt, unable to leave the building where they live behind the takeaway, except when Kurt takes her to the forest on Mondays to tend their bee hives. She would love to spend more time in the forest, to see the wedge-tailed eagles and the beautiful old trees. She would love to meet other people, to experience the outside world. But Kurt says she must stay inside, under lock and key when he is away, for her own safety. Leon has moved to the town from Bruny Island. He’s stayed on Bruny Island to protect his mother from his father, but now his father is fragile, and Leon thinks he can safely leave. He’s descended from a long line of loggers, but he’s a park ranger. His grandfather lives in a nursing home nearby, but Leon knows no-one else in the town. Leon is an outsider, viewed with suspicion (at best) and bullied by some of the loggers. He tries to fit in by joining the local football team. Max is 10 years old. He lives next door to Leon and is struggling under the weight of his father’s expectations. It doesn’t seem to matter what Max does, it never seems good enough. And it doesn’t help when his parents argue. But things get out of hand when Max is threatened and bullied by the police sergeant’s son. There are plenty of issues woven through this novel: bullying, domestic violence, insecurity and insidious secrets. There’s also a fine appreciation of the natural environment: from the beautiful old trees to the rare wedge-tailed eagles, and the tragedy of the Tasmanian Devil Facial Tumour Disease. Ms Viggers realistically depicts the tension between conservationists and the loggers. The loggers are fighting for economic survival in an environment with limited employment prospects and will resist any attempt to restrict logging even though they recognise sustainability issues. And there’s Kurt. Miki’s brother has secrets of his own. I loved this novel for several different reasons. I enjoyed the finely depicted main characters, the sensitive handling of some difficult issues, and Ms Viggers’s keen appreciation of the country in which the novel is set. And then there were Miki’s books (‘Jane Eyre’, ‘Wuthering Heights’ and ‘Tess of the D’urbervilles’) which had belonged to her mother, Leon’s shift from Bruny Island (where readers of ‘The Lightkeeper’s Wife will remember him) and Max’s struggle to protect what is important to him. I could not put the book down. There’s courage in this novel: breaking free from the past is never easy. There’s hope, too, that the bullying and the violence will be eradicated as people recognise what is happening. I finished this novel wondering what the future would hold for Miki, Leon and Max. I really enjoyed this book by Karen Viggers. I thought at the beginning that I could see how it would end, but it didn't turn out how I expected, which was a nice surprise. I loved the descriptions of the Tasmanian bush and the Tassie devils - I've not been to Tasmania before, but the descriptions made me feel like I was there. Some of the themes of the story were quite heavy - domestic abuse, manipulation, bullying - but they were really well dealt with, and despite the sombre themes, the story I really enjoyed this book by Karen Viggers. I thought at the beginning that I could see how it would end, but it didn't turn out how I expected, which was a nice surprise. I loved the descriptions of the Tasmanian bush and the Tassie devils - I've not been to Tasmania before, but the descriptions made me feel like I was there. I've read one other of Karen Viggers' books - The Grass Castle - and I think I enjoyed it at the time (it was about 18 months ago that I read it, but I gave it 4★), but I think this one has more depth to it and I feel like the author has definitely developed in the 5 years since she wrote that one. Thank you so much to Allen & Unwin for the uncorrected proof I received. The Orchardist’s Daughter is a rich, no-holds-barred portrait of life in a small Tasmanian community, covering issues from environmental protection to domestic violence and emotional abuse (note some material may be triggering). It’s a far heavier read than I expected, but Viggers imbues her realism with just the right dose of hope to be empowering. Nearly eighteen year old Miki lives under her brother’s thumb, locked in their house and unable to influence anything about her life, even which stat The Orchardist’s Daughter is a rich, no-holds-barred portrait of life in a small Tasmanian community, covering issues from environmental protection to domestic violence and emotional abuse (note some material may be triggering). It’s a far heavier read than I expected, but Viggers imbues her realism with just the right dose of hope to be empowering. Nearly eighteen year old Miki lives under her brother’s thumb, locked in their house and unable to influence anything about her life, even which station is on the TV. At the same time, Leon moves into their logging community as an instant outsider – who could be more loathed by loggers than a park ranger? Both characters have their Rubicons to cross, but it’s their interactions in the small town community that form the heart of this story. Viggers beautifully (and at times excruciatingly) captures the pressures, perks and quirks of small town life with the same natural ease as Chris Hammer in Scrublands – the town and its inhabitants feel impressively real. The community forms both the cause of conflict and the means to support resolution, showing the complex nature of human interactions. I felt uncomfortable with the dominant masculine culture of the town and its inhabitants – there are very few fathers/adult men who are likeable – but Viggers is shining a spotlight on the toxic environments that do exist, and the ways they can (and must) be altered. I must admit I spent most of this novel in a state of anxiety for both Miki and Leon, which is a testament to Viggers’ writing and pacing. The dramatic climax is visceral and violent, but not gratuitous – rather, it feels necessary after the pressure-cooker of the build up. The plot is laced with tension and conflict – Miki’s struggle for independence, Leon’s battle for acceptance; loggers versus conservationists, poverty versus principle – but I was especially moved by the subplot of Leon’s young neighbor Max, who experiences bullying and peer pressure that draws him away from the innocence and joy of his childhood. I was invested in all of these conflicts, and none felt superficial or glossed over, as they might in the hands of an inferior storyteller. But with Viggers,we’re in good hands. Notably, she gives great power to older characters – Leon’s grandfather and Geraldine at the community centre both have dramatic influences on events (vague, but I don’t want to spoil things!) which I adored! But Viggers’ writing really shines when she’s describing the landscape – Tasmania’s old growth forests come to life under her compassionate hand, from their sprawl to their destruction. I was lucky enough to hear Viggers in conversation last week and she admitted “I have to write what is true to me and what is in my heart… And I’m at my best when I’m in a natural environment.” Her love for animals leaps off the page too, drawing attention to the plight of Tasmanian devils and other rare species, as much as the neglect of domestic pets. My only gripe was with the title – while Miki is the eponymous daughter, I felt that Leon shared the spotlight as the novel’s protagonist. In many ways he’s the catalyst for change in the community and without his arrival other plotlines wouldn’t have been possible. But overall The Orchardist’s Daughter is a vital, honest look at community, the environment and courage that you won’t regret picking up. I received a copy of The Orchardist’s Daughter from Allen and Unwin in exchange for an honest review. All opinions are my own. I'm not a great fan of this book - I just think it was a bland story with a "nothing" ending. Harsh words and I'm sure there will be people who love this book, just not for me. Contains spoilers, but trust me, I'm doing you a favour. The book begins with a tragedy, a house fire in which the protagonist Miki and her evil brother Kurt's parents are killed. The cause of the fire is a mystery and the family have been living a hermit-like lifestyle of unnamed religious observance in rural Tasmania. It's an interesting enough premise and one that reminded me of Tara Westover’s excellent memoir, 'Educated'. Readers might think that these are the themes that the book is going t Contains spoilers, but trust me, I'm doing you a favour. The book begins with a tragedy, a house fire in which the protagonist Miki and her evil brother Kurt's parents are killed. The cause of the fire is a mystery and the family have been living a hermit-like lifestyle of unnamed religious observance in rural Tasmania. It's an interesting enough premise and one that reminded me of Tara Westover’s excellent memoir, 'Educated'. Readers might think that these are the themes that the book is going to explore and indeed, that might have led to a much better book. Unfortunately, things head in a different direction. Instead the siblings move to a small Tasmanian logging town to inexplicably give up their religion (a decision of Kurt’s that is unexplained and is accepted by Miki without question, despite religion apparently having being the foundation of her life to to that point) and start running a fish and chip shop. This happens in chapter 3 and by this point the book is already falling apart. Miki is kept as a slave by her brother Kurt but even this theme is explored only in passing. Some other characters emerge, none of whom are particularly believable or likeable, especially when they open their mouths. (The dialogue in this book is truly terrible, amongst the worst I've ever read, and renders the characters unsympathetic and unbelievable.) The new parks ranger Leon finds himself drawn into battle with the local loggers, particularly on the football field. You can see a moral victory of sorts coming when the loggers want to cut down a protected tree, but this inevitability is so obvious it hurts. The characters in the town are utterly unlikeable and any difficult issues that arise have magical solutions that void the need for plot development or proper characterization. Have a problem with domestic violence? Don't worry, your neighbours will ignore it for years and then miraculously solve it by talking to your husband. Bullied by the policeman's son? No problem, that can be solved by talking to the school principal. Need to get rid of a bunch of birthday cards from a mysterious relative your sister knows nothing about? Of course, you should burn down the entire building the cards are housed in! And perhaps most laughably of all, if you're kept in slave-like conditions by your brother but he happens to go to jail for running a meth lab and marijuana plantation, not to worry, there's sure to be a mysterious benefactor who's left you a generous allowance in her will. Karen Viggers can't be blamed for writing this book, but her editor and publisher should hang their heads in shame for putting it in reader's hands in this state. I'm particularly perturbed by the number of five star reviews for this book that appear with a disclaimer that the so-called unbiased reviewers were rewarded with a free copy of the book (not that I would want one; I returned my copy to the shop and told the bookseller that it was the worst book I've read in years, and he readily agreed!). The publisher has obviously gone all-out to get this on the shelves without a decent edit (i.e. rewrite with a completely different focus and plot). Allen and Unwin are actually marketing the book with a sticker on the front stating, "Read it. Love it. Or your money back." If you feel the same way as me, I urge you to take advantage of this offer! I broke two of my rules (no books where the title mentions wife, daughter or girl and no books whose covers feature women in frocks from the back). I broke them because I want to read more by local authors. I don't regret the choice but I did return unfinished 3 Stella Prize shortlist titles this week, so I regret the precious reading time. The setting, rural southern Tasmania, was the best part of this book. The characters are cliched and the twists well telegraphed and everything is explained. I broke two of my rules (no books where the title mentions wife, daughter or girl and no books whose covers feature women in frocks from the back). I broke them because I want to read more by local authors. I don't regret the choice but I did return unfinished 3 Stella Prize shortlist titles this week, so I regret the precious reading time. 4.5 would be a better rating. I received this copy from Allen & Unwin. This is such a big story. So big, I can see these great characters in future books as they have so much more to offer. The book takes place in Tasmania with concurrent tales of young Max and his family, Leon starting a new life and Mikaela and her brother Kurt starting over after a fire. The characters slowly intersect each other’s lives until the tension filled ending, which will have you reading like mad and holding your b 4.5 would be a better rating. The book takes place in Tasmania with concurrent tales of young Max and his family, Leon starting a new life and Mikaela and her brother Kurt starting over after a fire. The characters slowly intersect each other’s lives until the tension filled ending, which will have you reading like mad and holding your breath! I found this story really interesting in lots of different ways. Mikaela lived a very isolated life on her parent’s farm. Her father had strong ideas about what constituted men’s work and what was women’s work and Mikaela stayed mostly inside being homeschooled in Jesus by her mother and helping with chores. Occasionally though, her father allowed her outside work and these times were her favourite. She has a real connection to the land and after her parents are lost in a house fire and the farm I found this story really interesting in lots of different ways. Mikaela lived a very isolated life on her parent’s farm. Her father had strong ideas about what constituted men’s work and what was women’s work and Mikaela stayed mostly inside being homeschooled in Jesus by her mother and helping with chores. Occasionally though, her father allowed her outside work and these times were her favourite. She has a real connection to the land and after her parents are lost in a house fire and the farm sold, she moves with her brother Kurt, 10yrs her senior to a logging town. There they run a fish and chip shop while Kurt saves for them to purchase another farm. As Mikaela approaches 18, she dreams of freedom. It’s what she should be experiencing, freed from the oppressiveness of her home life but instead Kurt seeks to restrict her more and more. He doesn’t like her talking to the customers but his own demeanour is less than friendly to the people they rely on for their livelihood. He doesn’t allow her to go out on her own, locking her inside the premises at the back of the shop when he goes out. Mikaela is concerned about the flashy new purchases that Kurt is making when they should be saving for a farm, to get back on the land. That’s what she desperately wants. Leon is new to town, a ‘Parkie’ which puts him at odds with a lot of the locals who are loggers by trade. Tensions are simmering in the small town, ready to reach boiling point as the logging is shut down and the men are without work. Leon tries to fit in by playing for the local footy team but he faces ostracisation and hostility, people making assumptions about him before even getting to know him and what he stands for. You’re either a logger or you’re not – and if you’re not, then they’re against you. Leon and Mikaela don’t interact a lot at first, but his appearance in town is the catalyst to a lot of things being set in motion. Leon befriends the son of his neighbour and tries his best to integrate himself into the town in lots of different ways. I really enjoyed the budding friendship between Leon and Max, the young boy next door who is struggling with a bullying issue at school and struggling with home issues as well. Leon is perhaps the first one to really notice what’s going on with Max as well and not just dismissing it as a school kids being school kids type of thing. Leon is remarkably persistent, even in the face of some pretty awful treatment by some of the men in town, determined to forge good relationships and try and fit in. I guess he knows his job and life will be easier if he can be accepted and he’s willing to do whatever that takes. Leon’s willingness to help in troubled times and the fact that he keeps just showing up means that eventually people start coming around to him. Leon also forms a friendship with Mikaela, connected to the wilderness. Mikaela loves being outside in the forest and she’s passionate about preserving and saving the local wildlife. She has a connection to the local Tasmanian devil population and she manages to sneak out for several trips to help monitor them. The more time Mikaela spends with others (not just Leon, also some other locals) the more she realises that what is happening to her is wrong. She’s legally an adult now, even if her brother says that she cannot be independent until she’s 21. She should have the right to come and go as she pleases. Instead her life is shaped by her brother’s moods – sometimes Kurt is in a good mood and they go explore the forest and he’ll answer questions about his childhood. But most of the time Kurt’s moods aren’t good and this is when Mikaela knows any sort of effort to engage him will be futile. Kurt’s moods are also escalating as well, trapping Mikaela in a steadily increasing dangerous environment. There’s quite a lot of (mostly off page) violence in this novel. One of the men on the football team regularly beats his wife and the town seems to turn a blind eye. There’s Max’s trouble with an older school boy, which also seems to largely go unnoticed for a long time, other than by Leon and to a lesser extent, Mikaela. There’s Kurt’s restrictive treatment of Mikaela, locking her up and sending her to the back whenever he doesn’t want her talking to people in the shop. He becomes more and more paranoid as well, particularly after witnessing a few interactions with Leon. And then there’s Leon’s home life, which is bleak also. His ill father isn’t able to cope with being a shadow of his former self and tends to take it out on Leon’s mother when Leon isn’t around. Leon’s mother constantly forgives him and urges Leon to do the same, thereby sweeping it under the rug and diminishing it in importance. As a reader, I really enjoyed the role that books played in the narrative with Mikaela. She loves reading but her brother restricts her access. However Mikaela discovers a kind local who is happy to lend her books – choosing them rather carefully I thought so that Mikaela might learn something from each one she reads. Mikaela has lovely insight and it’s clear that she should really be finishing a more formal education, studying literature or something similar, as she works towards returning to the land in some way, which is ‘home’ for her. This was a really intriguing story showcasing issues of family violence, the struggle of making a living versus conservation and small town dynamics. I really appreciated the setting and the deeply flawed characters and their relationships. The writing is beautiful and drew me into the story from the very first page and kept me riveted until the end. This book is told through the eyes of three very different point of view characters: a young woman raised in religious extremism, a young man who is a park ranger in a logging town, and a boy whose father is a heavy drinker and unproud of his son. Set in a fictional town southwest of Hobart, the story promises to be about the conflict between loggers and conservationists. However, it fails to really explore this theme in depth and skirts around the edges failing to deliver. Instead, the book bec This book is told through the eyes of three very different point of view characters: a young woman raised in religious extremism, a young man who is a park ranger in a logging town, and a boy whose father is a heavy drinker and unproud of his son. Set in a fictional town southwest of Hobart, the story promises to be about the conflict between loggers and conservationists. However, it fails to really explore this theme in depth and skirts around the edges failing to deliver. Instead, the book become about bullying, abuse, and domestic violence. It also provides insight into how hard it is to belong in a small town when you don’t fit into the mold. Having lived in a logging town in Tasmania I know from first-hand experience that the characters could easily be base on real people. The experiences they have are real as is the social malaise of the town. Yet the story is biased and paints everyone who works in the timber industry with the same brush. The town is also unrealistic because it fails to show that the region is diverse supporting farmers, fisherman and even master craftspeople who build boats and musical instruments. I wonder whether permission was sought from Bob Brown for his appearance. I doubt very much he’d use the word “whitefellas”. I could not help but feel that the book lacked depth. Too much of the story is told rather than shown and I always felt distanced from the main characters and their problems. Just as we are never really taken into the conflict between the loggers and the conservationists, the author fails to explain the religion that drove a man to almost commit murder whilst completely dominating his sister. Again, too much skirting and not enough explanation. The pace of the story is quite slow and the plot is about overcoming. Yet, just when the characters win their freedom the story ends and we are left wondering what they will become. I was also left with more questions than answers because the author failed to tie up the loose ends. Viggers projects the forests of Southern Tasmania as a central character in her engaging Australian "yarn". And, this is what her readers will most enjoy. Against a backdrop of the ongoing controversy between "loggers" and so-called "greenies", the residents of a remote rural town struggle to find their own voices. The central character, Miki, must fight against the manipulative, controlling power of her guardian-brother if she is to live her own life. Kurt's abusive behaviour leads the narrative Viggers projects the forests of Southern Tasmania as a central character in her engaging Australian "yarn". And, this is what her readers will most enjoy. Against a backdrop of the ongoing controversy between "loggers" and so-called "greenies", the residents of a remote rural town struggle to find their own voices. The central character, Miki, must fight against the manipulative, controlling power of her guardian-brother if she is to live her own life. Kurt's abusive behaviour leads the narrative into many dark corners, ultimately to a conclusion that no one could have predicted. Leon, the new "Parkie" (Park Ranger), must fight to find his place in a town marked by violent opposition to his environmental concerns. Max, a young boy who is befriended by Leon, struggles against a school bully who takes control of his life with threats and violence. Sadly, domestic abuse is also present in several of the family homes in the town. From these challenges, friendships are formed that become a positive force in the characters' lives. A fire destroys the family home killing the parents of sixteen-year-old Mikaela and her brother Kurt. Mikaela has never been away from the farm, is home-schooled and knows nobody other than her family. After the fire they set up a take-away fish and chips shop in town and Kurt keeps Mikaela trapped inside, she is never allowed to go outside and when he goes away to Hobart one day a week he locks her in the shop. This is how his parents lived their lives. Leon moves from Bruny Island in Tasmania A fire destroys the family home killing the parents of sixteen-year-old Mikaela and her brother Kurt. Mikaela has never been away from the farm, is home-schooled and knows nobody other than her family. After the fire they set up a take-away fish and chips shop in town and Kurt keeps Mikaela trapped inside, she is never allowed to go outside and when he goes away to Hobart one day a week he locks her in the shop. This is how his parents lived their lives. Leon moves from Bruny Island in Tasmania to a new job as park ranger. He calls into the take-away every now and then and meets Miki and suspects she's being held like a prisoner in the business. Max is an eight-year-old who lives next door to Leon. He is being bullied by a big boy at school. Karen Viggers story includes bullying, abuse, alcohol addiction, Tasmanian devils who are on the verge of extinction as well as the old-growth forests in Tasmania. Published by Allen&Unwin, The Orchadist's Daughter is Karen Viggers first novel. Whilst I enjoyed this book, I wanted more. The relationship between Miki and Kurt deserved more exploration and I feel like I knew what was coming before Miki did. Visually, the book was extremely enjoyable. I've never visited Tasmania but I felt like I was there with the characters. I could smell the forest, the fish and chip shop, even the woodfire in the visitor's centre. I can see why others love this book, Published by Allen&Unwin, The Orchadist's Daughter is Karen Viggers first novel. This book simmers with tension. Ms Viggers has written yet another great book but I had to stop and have a break halfway through - unusual for me. This was because of the many flawed and ugly characters and a very tense storyline. Not an easy book to read if that is what you are looking for but then Karen Viggers doesn't do "easy". Yet again she has excelled. I loved it. Understanding Leon's struggle to be accepted into a new community, but his never failing humanity for all around him. Meeting Mikaela and understanding the isolation she was forced to endure. Max's struggle with bullying and his love for his dog Rosie and all her pups. But above all, reading more about Tasmania's wilderness was just beguiling. This was an exceptional read! Set in a small town in Tasmania it was realistic, riveting and held me well until the end. It was odd because I'd only just finished Tara Westover's Educated and this was quite similar in some ways. Since then she has worke Karen Viggers was born in Melbourne, Australia, and grew up in the Dandenong Ranges riding horses and writing stories. She studied Veterinary Science at Melbourne University, and then worked in mixed animal practice for seven years before completing a PhD at the Australian National University, Canberra, in wildlife health from which she published numerous scientific papers. Since then she has worked on a wide range of Australian native animals in many different natural environments.